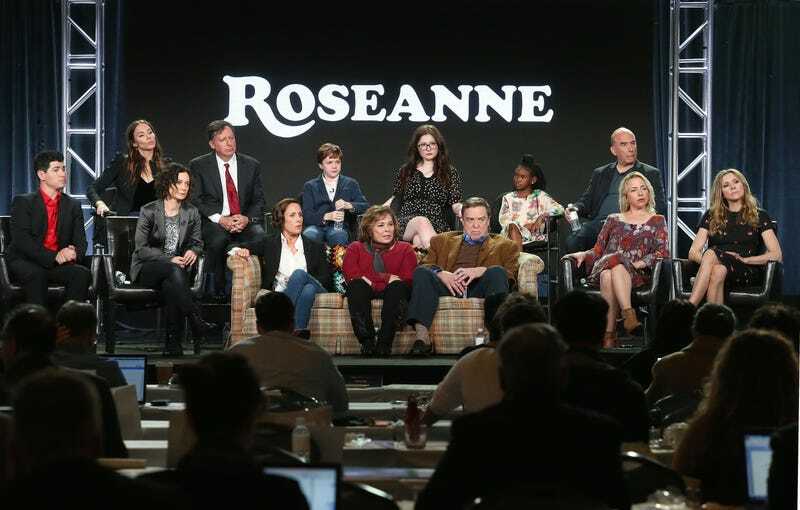 Production crew and cast of Roseanne in January 2018 in Pasadena, Calif.
Looks like ABC is not about to let the Roseanne revival die, even after its titular star, in a state of allegedly Ambien-fueled racism, sent out a tweet describing former Barack Obama adviser Valerie Jarrett as a product of the Muslim Brotherhood and the Planet of the Apes. According to the Associated Press, the canceled Roseanne revival will now be revived again (got more lives than a cat, this show) to focus on the Conner family, minus Roseanne Barr, of course. The network has ordered 10 episodes of The Conners (a working title) after Barr agreed to waive any creative or financial participation in it, which was a condition of the network’s deciding to go forward with the series. Barr said that she agreed with the settlement in order to save the jobs of the 200 cast and crew members whose lives were ruined who were left hanging after the show was canceled last month because of her racist tweet. Of course, that still leaves some questions, like how exactly Barr’s character, who was the family matriarch, will be dealt with and whether fans will even give a damn about continuing to watch the show after Barr’s removal. The only comment the network had in its announcement was, “After a sudden turn of events, the Conners are forced to face the daily struggles of life in Lanford in a way they never have before. “The spinoff will continue to portray contemporary issues that are as relevant today as they were 30 years ago,” ABC added. The spinoff will star John Goodman, Laurie Metcalf, Sara Gilbert and other cast members from Roseanne.